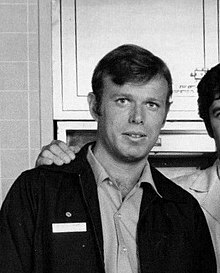 Kevin Tighe (born Jon Kevin Fishburn; August 13, 1944) is an American actor who has worked in television, film, and theatre since the late 1960s. He is best known for his character, firefighter-paramedic Roy DeSoto, on the 1972-77 NBC series Emergency! Tighe in cast photo from Emergency! Tighe was cast in his first major film as an extra in 1967's The Graduate. After being under contract with Paramount and Universal, Tighe's career took a turn from bit parts and extra work when he was cast as Roy DeSoto on Emergency!. Following Emergency!, Tighe went on to make numerous guest television appearances in shows such as Ellery Queen, Cos, The Hardy Boys/Nancy Drew Mysteries, and The Six Million Dollar Man. Aside from The Graduate, some of Tighe's film credits include Road House, City of Hope, What's Eating Gilbert Grape, and Jade. Tighe won a 1994 Genie Award for Best Supporting Actor in I Love a Man in Uniform. In the 2000s he played Anthony Cooper on the ABC television series Lost, as well as Giles Corey in the premiere episode of the original WGN America series Salem. Tighe has also been seen in a number of stage productions including A Reckoning, Mourning Becomes Electra, Anna Christie, Other Desert Cities, and Curse of the Starving Class. Tighe was born Jon Kevin Fishburn in Los Angeles, California, of Czech-Bohemian and Irish descent, the son of an actor. When he was five, Tighe moved with his family from Los Angeles to nearby Pasadena, where he began acting at an early age, auditioning for juvenile leads at the Pasadena Playhouse. He graduated from Pasadena High School in 1962, and went on to attend Pasadena City College before receiving an undergraduate degree from USC and then an MFA for acting in 1967. After USC, Tighe was drafted into the United States Army. Due to an injury to his finger, he was stationed for two years at Fort Knox rather than being sent to Vietnam. Since 1985, Tighe has resided in Skagit County, Washington with his wife, the artist Rebecca Fletcher. From Skagit County, he travels to New York and Los Angeles for work. Tighe has a daughter from his first marriage (to Mary Lou Seaman), Jennifer Tighe, an actress with whom he appeared in the stage production of A Reckoning. Tighe's first film appearance was in 1967 as fraternity brother in The Graduate, after which he appeared in two other films: Narcotics: Pit of Despair and Yours, Mine and Ours. After being discharged from the Army, Tighe appeared at the Taper Theater in Los Angeles in "The Trial of the Catonsville Nine" and in Noël Coward's "Design for Living" at the Ahmanson Theatre, also in Los Angeles. After this, he went on to perform in "Design for Living" with the National Theatre of Great Britain. During this period Tighe worked with a number of well-known actors including Lorne Greene, Maggie Smith, and Michael Landon before signing a contract with Universal Studios. During Tighe's tenure at Paramount, he appeared on NBC's Bonanza in the episode, "The Weary Willies". Tighe auditioned for a new Jack Webb television series, Emergency! in 1972 and landed the role of firefighter-paramedic Roy DeSoto, alongside Randolph Mantooth as his partner, John Gage. DeSoto and his team would respond to vehicle crashes, medical emergencies, and other rescues in a fire department rescue squad. After receiving advice and treatment orders from a local hospital via radiotelephone, the medics performed advanced life support techniques to stabilize patients needing aid before having them transported to a medical facility. In order to better portray his character, Tighe, along with other actors on the show, sat in on paramedic classes and participated in "ride-alongs" with the LA County Fire Department. When the show premiered, there were only 12 paramedic units in North America; the show is credited with introducing its audience to the concept of pre-hospital care, fire prevention, and CPR. In a 2006 Seattle radio interview, Tighe stated that Emergency! "...resonated with working people and I was always very proud of that fact. It promoted the paramedic program." During the series' run and after it was cancelled, Tighe became and remained friends with Mantooth as well as London and Troup. Tighe served as a best man at Mantooth's second wedding in 2002. Through his friendship with Troup and London, who were married to each other as well as recording artists prior to being cast on the show, Tighe had the opportunity to meet well known jazz musicians and artists. Both Tighe and Mantooth appear in the video presentation The Pioneers of Paramedicine Story, a project done in conjunction with the Los Angeles County Fire Museum. Originally filmed in 2001 with additional scenes filmed in 2013, the video is a documentation of the history of pre-hospital medicine. Tighe was an honorary committee member on Project 51 and its efforts to honor Emergency! 's legacy. Tighe conducted interviews and compiled a brief history of American EMS for the project. Roy DeSoto's uniform, along with some of the medical equipment used on the show was inducted into the Smithsonian Institution's National Museum of American History in the Public Services division in May 2000. Along with Mantooth, Tighe was presented in 2012 with a traditional white leather firefighter helmet by the Los Angeles County Fire Department as Honorary Fire Chief. The honor was bestowed on for contributions to the fire service and emergency medicine through educating and inspiring others to work in firefighting and EMS. After the cancellation of Emergency!, Tighe continued to work in episodic television, appearing on Ellery Queen, Cos, The Hardy Boys/Nancy Drew Mysteries, The Six Million Dollar Man, and The Love Boat. He also appeared on the CBS Library production of "Orphans, Waifs, and Wards" and as Thomas Jefferson in an adaptation of the John Jakes novel The Rebels in 1979. During the 80s, Tighe taught drama at USC. To keep his acting skills honed, he once again studied acting, this time with Robert Lewis and Stella Adler in New York City. He worked in summer stock as part of a company directed by Alfred Christie at the Hampton Playhouse in 1980, and performed in Come Blow Your Horn. In 1983, Tighe was cast in Two for the Seesaw at William Putch's Totem Pole Playhouse in Caledonia, Pennsylvania. Tighe made his Broadway debut at the Music Box Theatre in the play, Open Admissions; the show closed after two weeks. He then acted in Night of the Iguana with McCarter Theatre Company, in Princeton, NJ; Mark Weller's The Ballad of Soapy Smith in 1983 at the Seattle Repertory Theatre in Seattle; and the New York Shakespeare Festival at the Public Theatre in New York City. In 1989, he received an NEA fellowship at the Seattle Repertory Theatre. Tighe also wrote and directed Homegirl for the Seattle Repertory Theatre in 1986. After returning to Los Angeles in 1986, Tighe began working again in television and movies. His late 1980s movie appearances were in Matewan, Eight Men Out, K-9, and as club-owner Frank Tilghman in 1989's Road House with Patrick Swayze. During a 2006 interview, Tighe stated, "I've gotten more comments on that movie than any other film I've ever done." Saying he is amazed by the film's broad audience appeal, he further said, "Working class people like it, (college kids), white people, black people. I think a lot of that is due to the music ... the movie had great music." Tighe's work in the 1990s included work on episodic television crime, drama, and science-fiction programs. Tighe appeared on episodes of Murder, She Wrote, Tales from the Crypt, Under Suspicion, Chicago Hope, The Single Guy, ER, The Outer Limits. For six episodes, he portrayed police detective David Blalock on the crime and legal drama, Murder One and Henry Janeway, an ancestor of Captain Kathryn Janeway, in the Star Trek: Voyager episode "11:59". Besides episodic work, Tighe appeared in a number of television movies during the 90s, including Perry Mason: The Case of the Defiant Daughter, the remake of Escape to Witch Mountain, and slain Kansas father and farmer Herb Clutter in the 1996 miniseries adaptation of Truman Capote's book In Cold Blood. Tighe also portrayed newspaper legend William Randolph Hearst in Winchell. Tighe's roles in feature films included lawyers, law enforcement officers, and military figures including the part of Blake Wilson in the Eddie Murphy and Nick Nolte vehicle Another 48 Hrs. Other film roles during this period were in Bright Angel, City of Hope, Newsies, School Ties, and Mumford. Tighe portrayed Ken Carver in What's Eating Gilbert Grape and Brigadier General Nelson Miles Geronimo: An American Legend. In 1994, he won a Genie Award for Best Supporting Actor in the role of "Frank" in I Love a Man in Uniform. Tighe continued to work in theater and appeared in three different roles: Hilton Lasker, Swifty, and Lord Kitterson in The End of the Day: An Entertainment at the Seattle Repertory Theatre, in 1989 and 1990. Tighe continued to do plays in the 1990s at the Seattle Repertory Theatre including Hedda Gabler in 1992. Tighe continued to do episodic work on both cable and network television and appeared on Freaks and Geeks, Family Law, The West Wing portraying Governor of Indiana Jack Buckland, Strange World, Everwood, Law & Order: Criminal Intent, The 4400, and Law & Order: Special Victims Unit. Tighe appeared numerous times on ABC show, Lost, as Anthony Cooper, father of John Locke. His work included episodes of Numb3rs, Leverage, and Lie to Me. His work on television included two movies and mini-series. Tighe appeared in The Sight, and Nancy Drew. He has also continued to work heavily in film and has appeared in Fast Food High, The Deal, Today You Die, and My Bloody Valentine. Tighe portrayed William Gottschalk in three of the Tulse Luper films: The Tulse Luper Suitcases, Part 1: The Moab Story, The Tulse Luper Suitcases: Antwerp, and A Life in Suitcases. Tighe worked in regional and repertory theater, with the bulk of his stage work in Seattle. Tighe played Mick Dowd, a gravedigger, in Martin McDonagh's A Skull in Connemara at ACT Theatre in Seattle in 2000. Six months later, the production moved to New York, where it played at the Roundabout Theatre Company and Gramercy Theatre. Tighe played Salter in A Number, exploring the human consequences of cloning. at the ACT Theatre in Seattle. His character examines parent-child relationships in five concentrated scenes through his three cloned sons and the nature of human bonds. Tighe played Captain Channing on Trauma. His recent episodic television work includes Common Law, Complications, and Salem. His most recent film appearance is I am I, released in June 2014. Tighe narrated the documentary, The Mountain Runners, examining the mountain marathon runners at Mount Hood in the early 1900s. Tighe was interviewed for America on Stage examining the development of new plays funded by the National Endowment for the Arts. Tighe appeared on a documentary that was aired on the PBS program, Independent Lens. The documentary examined the development and staging of a new play in "Playwright: From Page to Stage". Tighe played the title role in Rajiv Joseph's Pulitzer Prize-nominated drama Bengal Tiger at the Baghdad Zoo, about the lives of American soldiers who guard a philosophical tiger (Tighe) while on duty in the Iraq War. Tighe played the role in both the New York and at the Mark Taper Forum in Los Angeles productions, replacing Robin Williams, He won positive reviews for his performance of the Tiger. He won a 2010 Garland Award for best Performance in a Play. Tighe played Fredrik in Anatomy of Pain on the Mirror Stage at the Ethnic Cultural Theatre in Seattle in 2012. In Sam Shepard's Curse of the Starving Class, Tighe played Weston in 2013 at the Long Wharf Theatre in New Haven with Judith Ivey. He had the following thoughts in his approach to doing Shepard's play,"You have to beware of naturalism, which is the place actors tend to go into. You have to leave the ground for awhile and then hope you land." Later in 2013, Tighe played Lyman Wyeth in Other Desert Cities with Pamela Reed at ACT Theatre in Seattle. ^ a b c Hernandez, Ernio (2005). "Tighe Father and Daughter Play Family Members in A Reckoning; Opens March 5". Playbill. Playbill. Archived from the original on 29 May 2014. Retrieved 28 May 2014. ^ a b c d e f g King, Susan (April 21, 2010). "Rattling Kevin Tighe's cage". Los Angeles Times. Retrieved June 1, 2014. ^ "Kevin Tighe at FilmReference.com". filmreference.com. Retrieved June 6, 2014. ^ a b Bradley, Brad (2001). "Kevin Tighe Up Close: An Irishman at Heart". Irish American Post Vol. 1, Issue 11. gaelicweb.com. Archived from the original on March 4, 2016. Retrieved June 1, 2014. ^ "Kevin Tighe, Pasadena Class of '61 in LA Times". Los Angeles Times. 1988. Retrieved June 6, 2014. ^ "Alumni::Kevin Tighe". paccd.cc.ca.us. 1999. Archived from the original on June 18, 2003. Retrieved May 30, 2014. ^ a b Berson, Misha. "Pamela Reed, Kevin Tighe at home in ACT production". The Seattle Times. Archived from the original on May 31, 2014. Retrieved May 31, 2014. ^ "Becky Fletcher biodata" (PDF). confluencegallery.com. Archived from the original (PDF) on May 13, 2015. Retrieved June 6, 2014. ^ "Donors Kevin Tighe and Becky Fletcher, North Cascades Institute 2010 Annual Report, Page 9" (PDF). ncascades.org. 2010. Retrieved June 6, 2014. ^ a b "Long Wharf Theatre stages Curse of the Starving Class February 13 through March 10". longwharf.org. Archived from the original on 2014-06-06. Retrieved June 3, 2014. ^ "Bonanza Season 12: The Weary Willies, episodes 1-4". Retrieved June 4, 2014. ^ a b c d "Randy Mantooth profile". randymantooth.com. Archived from the original on July 1, 2007. Retrieved January 12, 2014. ^ "Q & A with Randolph Mantooth". route51.com. February 1, 2014. Archived from the original on February 19, 2014. Retrieved February 2, 2014. ^ a b c d e f g h i Yokley, Richard; Sutherland, Roxane (2007). Emergency! Behind the Scenes. Jones & Bartlett Learning; 1 edition (July 13, 2007). ISBN 076374896X. ^ a b c d Beck, Dave (September 26, 2006). "Interview with Kevin Tighe about his role in 'A Number' (14:00 minute mark)". kuow.org. Retrieved June 6, 2014. ^ a b c d e Harrington, Amy (December 13, 2013). "Interview with Randolph Mantooth". emmytvlegends.org. Retrieved April 22, 2014. ^ "CRAGG LIVE - Randolph Mantooth, Marty Allen, & Jay Johnson". 23 November 2014. pp. (audio starts at 10:00). Retrieved 29 April 2014. ^ Limmer, Marty (1974). "Go! Television Show, LA County Fire and Paramedics". Retrieved 5 June 2014. ^ "The Pioneers of Paramedicine Story". pioneersofparamedicine.com. Retrieved 29 May 2014. ^ "Project 51 Committee members". squad51.org. 1999. Archived from the original on March 2, 2000. Retrieved 5 June 2014. ^ Tighe, Kevin (2000). "A Brief History of the American EMS Program". squad51.org. Archived from the original on August 23, 2000. Retrieved 5 June 2014. ^ Self, Ed (2000). "Project 51 On the Road to D.C." squad51.org. Archived from the original on August 23, 2000. Retrieved 5 June 2014. ^ a b Woyjeck, Joe (Fall 2012). "Randolph Mantooth & Kevin Tighe Made Honorary Fire Chiefs by the County of Los Angeles Fire Department" (PDF). lacountyfiremuseum.com. Retrieved 7 November 2014. ^ "Behind the Stage Door at the Hampton Playhouse". hampton.lib.nb.us. Retrieved 31 May 2014. ^ "'Come Blow Your Horn' Sweet and Loud at Lakewood". Lewiston (ME) Evening Journal. 11 July 1978. Retrieved 31 May 2014. ^ Putch, John (2013). "This is my Father". PutchFilms. Retrieved 7 June 2014. ^ a b "Open Admissions". playbillvault.com. Retrieved 29 May 2014. ^ a b Meyers, Joe (13 February 2013). "Director, star wrestle with challenging Sam Shepard play". CTPost.com. Retrieved 3 June 2014. ^ Berson, Misha (1992). "Well-Crafted Look into a Troubled Psyche". The Seattle Times. Retrieved 31 May 2014. ^ Gilmore, Susan (May 26, 2005). "'Ferry' tale to premiere tonight on Seattle-Bainbridge run". The Seattle Times. Retrieved May 31, 2014. ^ Berson, Misha (July 16, 2000). "Ex-bad boy playwright edges back into spotlight". The Seattle Times. Retrieved June 7, 2014. ^ Finkle, David (February 23, 2001). "A Skull in Connemara". theatermania.com. Retrieved May 31, 2014. ^ "Alexander to perform opening act at ACT". The Seattle Times. August 28, 2001. Retrieved May 31, 2014. ^ Miller, Marc (November 30, 2002). "Mourning Becomes Electra". theatermania.com. Retrieved May 31, 2014. ^ Toscano, Michael (May 16, 2005). "Anna Christie". theatermania.com. Retrieved March 1, 2015. ^ Berson, Misha (September 1, 2006). "Future shock: Playwright Churchill ponders cloning". The Seattle Times. Retrieved June 7, 2014. ^ Berson, Misha (September 10, 2006). "What it means to be human in a clone's world". The Seattle Times. Retrieved May 31, 2014. ^ "I am I trailer". iamithefilm.com. June 6, 2014. Retrieved March 1, 2015. ^ "The Mountain Runners". themountainrunners.com. 2012. Retrieved May 31, 2014. ^ Levi, Robert (2013). "America On Stage". imdb.com. Retrieved June 7, 2014. ^ Levi, Robert (2013). "Playwright: From Page to Stage". pbs.org. Retrieved June 6, 2014. ^ Propst, Andy (March 8, 2010). "Glenn Davis, Arian Moayed, Kevin Tighe, et al. Set for Rajiv Joseph's Bengal Tiger at the Baghdad Zoo". theatermania.com. Retrieved May 31, 2014. ^ "2010 Garland Awards for Excellence in Southland Theater". backstage.com. May 31, 2010. Retrieved June 6, 2014. ^ "Mirror Stage Announces THE ANATOMY OF PAIN, May 19–20". broadwayworld.com. May 3, 2012. Retrieved May 31, 2014. ^ Arnot, Christopher (February 27, 2013). "The Long Wharf Fattens Up Sam Shepard's 'Curse of the Starving Class'". The Baltimore Sun. Archived from the original on June 6, 2014. Retrieved May 31, 2014. ^ Brown, Donald (February 18, 2013). "A Contemporary 'Curse' Sam Shepard Comes to the Long Wharf". New Haven Review. Retrieved May 31, 2014.